This breakaway cable is compatible with Xbox 360 Rock Band and Guitar Hero wired guitars and drums. Dance Pads & any other gaming devices that utilize breakaway connections. 1 x Breakaway Cable. Simple and easy to use. Will not clash with your existing cable color. Colour : Grey. Length: approx. Type: Adapters & Cables. Easy to use. SmartPhone Accessories. Tablet Accessories. For Microsoft Xbox 360. See photos for specific item condition. The item you see in the photos is the item you shall receive. This breakaway cable is compatible with for Xbox 360 Rock Band and Guitar Hero wired guitars and drums. Dance Pads & any other gaming devices that utilize breakaway connections. Compatible with Xbox 360. Compatible with for Xbox for 360 & any other gaming devices that utilize breakaway connections. Protects the Xbox unit from “trip & smash” accidents. Also note that monitor settings may vary from computer to computer and may distort actual colors. 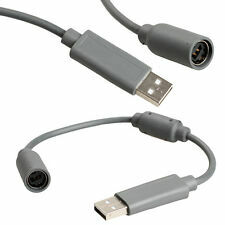 New and high quality USB breakaway cable for xbox 360 Easy to use Color: gray Platform: Xbox 360 Package Included: 1 x USB breakaway cable for xbox 360 Note:Light shooting and different displays may cause the color of the item in the picture a little different from the real thing.The measurement allowed error is /-1-3 cm. Brand Unbranded MPN Does not Apply EAN 4894462552018. I have for sale a Microsoft Xbox 360 Breakaway cable/lead in very good working condition. Fully tested & working perfectly. Ferrite bead protects against RF and EM interference. Easy to connect and disconnect. 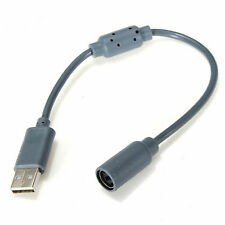 1x USB Breakaway Cable for Microsoft XBOX 360. Computers& Network Hardware. Hair Care & Styling. Ferrite bead protects against RF and EM interference. Protects the Xbox unit from rip smash accidents. This breakaway cable is compatible with Xbox 360 Rock Band and Guitar Hero wired guitars and drums. Dance Pads & any other gaming devices that utilize breakaway connections. Features: Easy to use. Convert your Xbox 360 controllers to be used on PC USB port The high-efficiency and flexible cable grants additional distance between your controller and console. A cost-effective wired controller break away cable enables you to play games more conveniently. Color Grey Length Approx. 24.5 cm / 9.6 inch Compatible With for Xbox 360 Wired Controllers Brand Unbranded/Generic MPN BL797822206696 EAN 797822206696. Compatible with for Xbox 360. Golocal24-7 specialise in providing accessories and repair parts for a wide, and high quality, range of gadgets. Easy to use and convenient to operate. Length: Approx. Color: As shown in the picture. Applicable models: XBOX 360. Line length: 25CM. Ferrite bead protects against RF and EM interference. Easy to connect and disconnect. 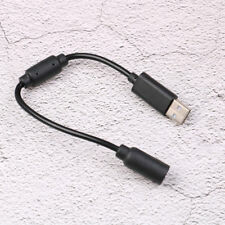 1x USB Breakaway Cable for Microsoft XBOX 360. This breakaway cable is compatible with for Xbox 360 Rock Band and Guitar Hero wired guitars and drums. Dance Pads & any other gaming devices that utilize breakaway connections. 1 x Breakaway Cable. Simple and easy to use. This breakaway cable is compatible with for Xbox 360 Rock Band and Guitar Hero wired guitars and drums. Dance Pads & any other gaming devices that utilize breakaway connections. Type: Breakaway Cable. Features: Easy to use. Convert your Xbox 360 controllers to be used on PC USB port The high-efficiency and flexible cable grants additional distance between your controller and console. A cost-effective wired controller break away cable enables you to play games more conveniently. Color Grey Length Approx. 24.5 cm / 9.6 inch Compatible With for Xbox 360 Wired Controllers Brand Unbranded/Generic MPN BL797822206696 EAN 0797822206382. For Xbox 360. Colour: Grey. USB to Breakaway Adapter port. Colour: Grey. I have for sale a genuine Microsoft breakaway extension cable for the Xbox 360. Fully tested & working perfectly. This is extra long compared to the standard length breakaway cable & is 51cm long. Genuine Microsoft & not a cheap import or copy! 1 x USB Breakaway Adapter Cable. This adapter cable is simple and easy to connect and disconnect. Kits Instalación Montaje Puerta Corredera Accesorio Granero Riel Acero 6 FT XUR. Cable Length: 0.23m. MICROSOFT XBOX 360 BREAKAWAY EXTENSION CABLE FOR THE XBOX 360. FULLY TESTED & WORKING PERFECTLY. THIS IS EXTRA LONG COMPARED TO THE STANDARD-LENGTH BREAKAWAY CABLE. THIS IS 51cm LONG. Ferrite bead protects against RF and EM interference. Easy to connect and disconnect. 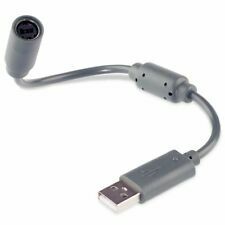 1x USB Breakaway Cable for Microsoft XBOX 360. Ferrite bead protects against RF and EM interference. Health & Personal Care. Features: Easy to use. Convert your Xbox 360 controllers to be used on PC USB port The high-efficiency and flexible cable grants additional distance between your controller and console. A cost-effective wired controller break away cable enables you to play games more conveniently. Color Grey Length Approx. 24.5 cm / 9.6 inch Compatible With for Xbox 360 Wired Controllers Brand Unbranded/Generic MPN BT797822206696 EAN 797822206696. Features: To prevent your Xbox 360 from crashing onto the floor when someone trips over a cable you need this replacement dongle USB breakaway cable for your Xbox 360 wired controllers. Ferrite bead protects against RF and EM interference. Easy to connect and disconnect. 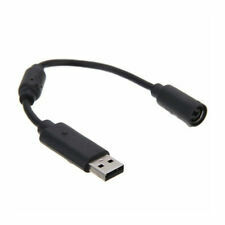 1x USB Breakaway Cable for Microsoft XBOX 360. Ferrite bead protects against RF and EM interference. ☆ Key Promotions ☆. 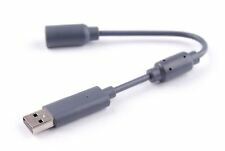 Features: To prevent your Xbox 360 from crashing onto the floor when someone trips over a cable you need this replacement dongle USB breakaway cable for your Xbox 360 wired controllers. Connect your Xbox controller cord to your system using this innovatively designed USB cable Work with any PC game that supports joystick or game pad controls. 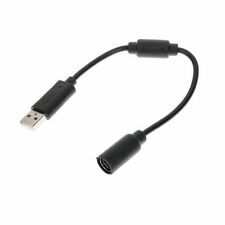 Compatible with gaming devices that utilize breakaway connections. 1 X USB Cable Adapter. Length: Approx. Features: Easy to use. Convert your Xbox 360 controllers to be used on PC USB port The high-efficiency and flexible cable grants additional distance between your controller and console. A cost-effective wired controller break away cable enables you to play games more conveniently. Color Grey Length Approx. 24.5 cm / 9.6 inch Compatible With for Xbox 360 Wired Controllers Brand Unbranded/Generic MPN HD797822206696 EAN 797822206696. I have for sale a Microsoft Xbox 360 Breakaway cable/lead. Compatible with with Rock Band and Guitar Hero wired guitar and drums, Dance Pads & any other gaming devices that utilize breakaway connections.